It's good to step out of my reading rut every once in a while. I will often bypass historical fiction because in my experience, the storytelling is often sacrificed to historical accuracy or detail. I suppose like any prejudice, this perception bears occasional re-examination. 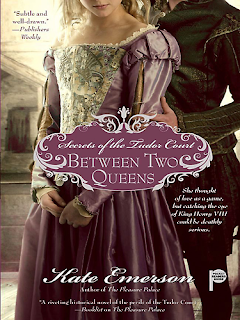 Whether it's a valid critique of the genre or not, I'm happy to say that Between Two Queens managed both a wonderful, engrossing story and historical context. Hyperbole aside, I did have the sense that the story was meticulously researched, supported by the excerpts of period letters prefacing the chapters, with exceptional personal details like Nan arguing with her mother about the quality of pearls that were sent for a court dress, and the fashionable expenses levied on the court by the caprices of the nobility. I very much enjoyed this story of Nan Bassett, a young girl who arrives as a lady in waiting, hoping for a glamorous life at court and an advantageous marriage. Unfortunately, the queen immediately goes into seclusion and then passes away shortly after giving birth, leaving the ladies in waiting with essentially no status in bachelor court. Point of view is meticulously maintained from Nan's character, giving the reader a great insight into not only the political machinations of her family, but the emotional struggle and maturation process of the character as she literally grows up amidst ever-shifting political sands and the precarious position of an attractive single woman with tenuous sponsorship. The novel format allows the author to bring the character to life and put the reader vividly in the time. Well. Give me a powerpoint deck and a boardroom full of squabbling VPs any day, is all I'm saying. At worst I might lose my job but nobody's gonna chop my head off for picking the wrong side! *I've never actually read that in an historical romance, but I've seen it on covers!